Buffett: Economy Has "Fallen Off A Cliff"
Billionaire Warren Buffett said the economy has "fallen off a cliff" over the past six months and consumers have changed their habits in remarkable ways. "It's fallen off a cliff," Buffett said. "Not only has the economy slowed down a lot, but people have really changed their habits like I haven't seen." Buffett said the changes are reflected in the results of Berkshire Hathaway Inc.'s subsidiaries. He said Berkshire's jewelry companies have suffered, but more people have been willing to switch to Geico to save money on car insurance. He predicted that unemployment will likely climb a lot higher before the recession is done, but he also reiterated his optimistic long-term view: "Everything will be all right. We do have the greatest economic machine that's ever been created." The nation's leaders need to clear up the confusion before anyone will become more confident, and he said all 535 members of Congress should stop the partisan bickering about solutions. 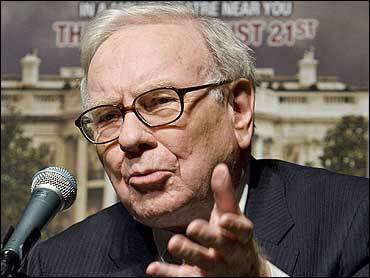 Buffett said he believes patriotic Republicans and Democrats will realize the nation is engaged in an economic war. "What is required is a commander in chief that's looked at like a commander in chief in a time of war," Buffett said. A little over a week ago, Buffett released his annual letter to shareholders describing the worst of his 44 years at the helm of Berkshire. The Omaha, Neb.-based company reported sharply lower profit because of its largely unrealized $7.5 billion investment and derivative losses. Overall, Berkshire's 2008 profit of $4.99 billion, or $3,224 per Class A share, was down 62 percent from $13.21 billion, or $8,548 per share, in 2007. Berkshire's fourth-quarter numbers were even worse. Buffett's company reported net income of $117 million, or $76 per share, down 96 percent from $2.95 billion, or $1,904 per share, a year earlier. Buffett said he doesn't regret writing an editorial last fall encouraging people to buy U.S. stocks, but he joked that in hindsight he wishes he'd waited a few months to publish the piece. Since that editorial appeared on Oct. 17, the Dow Jones industrial average has fallen from 8,852.22 to close at 6,626.94 on Friday. Buffett stands by his overall advice that over time owning stocks will be better than so-called safe investments. "Overall, equities are going to do far better than U.S. government bonds at these prices," he said. Buffett said he doesn't regret investing $8 billion of Berkshire's money in investment bank Goldman Sachs Group Inc. and conglomerate General Electric Co. last fall. Both companies gave Berkshire preferred shares paying 10 percent interest that Buffett said he doesn't think he could get now.